I live on the east coast of Scotland, not from choice. After 30 years here it still doesn't feel like home. Hence the name of my blog. West is still best as far as I am concerned. I'm married with two grown up 'boys'. I'm interested in books, films, art, crafts, cooking, politics, museums and travelling around Britain. 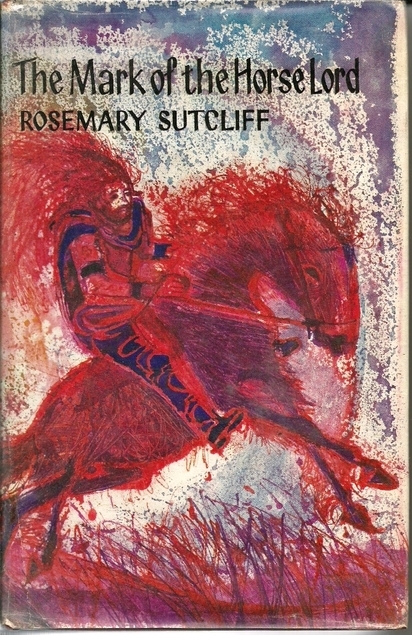 Participating in The 1965 Club encouraged me to read The Mark of the Horse Lord by Rosemary Sutcliff which I’ve had in the house for at least a couple of years. I would have read it sooner if I had realised that the setting is mainly in the exact place that I grew up – albeit some 2000 years or so earlier than when I was stravaiging about the land around Dumbarton Rock or Theodosia as the Romans called it, and Are-Cluta which is an ancient name for Dumbarton although it was more widely known locally as Alclutha. There is a handy map and glossary in my 1967 reprint of the book. The Romans are in control of most of Britain and Phaedrus is a young red haired gladiator hoping to win his freedom after spending seven years as a gladiator. He does gain his freedom but a drunken night of celebration leads him into big trouble and imprisonment again. He’s confused when he’s unexpectedly sprung from prison by a group of strangers, they had spotted how similar in looks Phaedrus is to Midris, their missing king. Eventually they talk Phaedrus into taking the king’s place and to try to eject the usurperer Queen Liadhan from Are Cluta (Dumbarton). Phaedrus will have to make the rest of the tribe believe that he is really King Midris. The real king has been blinded by Liadhan to make sure that he can never be accepted as their king again and he’s earning a living as a leather worker in the south. 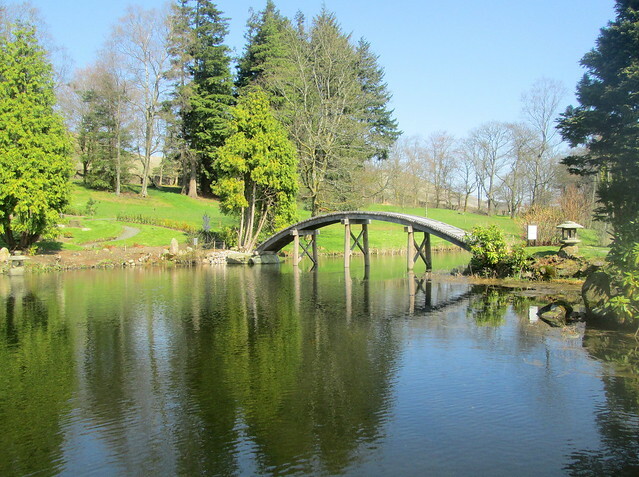 While travelling north of the Antonine Wall to Dumbarton Phaedrus works hard at learning the history of all of the tribe so that he won’t be discovered as a fake Midris, and eventually a brutal battle ensues. As you would expect of Rosemary Sutcliff this book is beautifully written, she does take some liberties with the geography of the area but not many readers would realise that. I was particularly pleased that she included an unusual character in the shape of a young warrior who just happened to be in touch with his feminine side when it came to clothes and jewellery. He was a bit of a fashion icon but the inclusion of Conory seems to have riled up the fundamentalist religious types one of whom cut her Goodreads rating right down to one star!!! for what she kept calling ‘content’. Honestly there is nothing in the least bit sexual in this book. Some people just go around their lives scouring everything for something they can object to, and if it isn’t there then they make up something that will feed their homophobia. I suppose it makes them feel superior somehow. But we all know better don’t we?! I’ll give it four stars on Goodreads. If you want to know what Dumbarton Rock (Theodosius) looks like have a keek at some of the posts on this link here. I read this one for The 1965 Club. 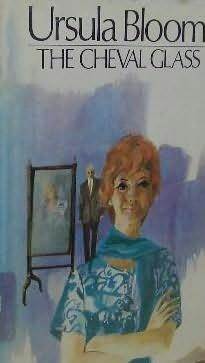 Ages ago I decided to take part in The 1965 Club which is being hosted by Kaggsy’s Bookish Ramblings, but I got mixed up with the dates and read a book a month too early, so if you are interested you can read my thoughts on what should have been my first read of the week The Looking-Glass War by John le Carre. I’ve just finished reading The Mark of the Horse Lord by Rosemary Sutcliff and I’ll blog about that one tomorrow. I’m going to be reading The White Guard by Mikhail Bulgakov for The Classics Club Spin # 20 as the number that came up in the spin is 19, and I have to read it by the 31st of May. I’m particularly pleased to get this one in the spin as the setting is Revolutionary Russia and amazingly I’m going to be in St Petersburg in May. Jack is insisting on calling it Leningrad as when he visited in the 1970s that was what it was called! 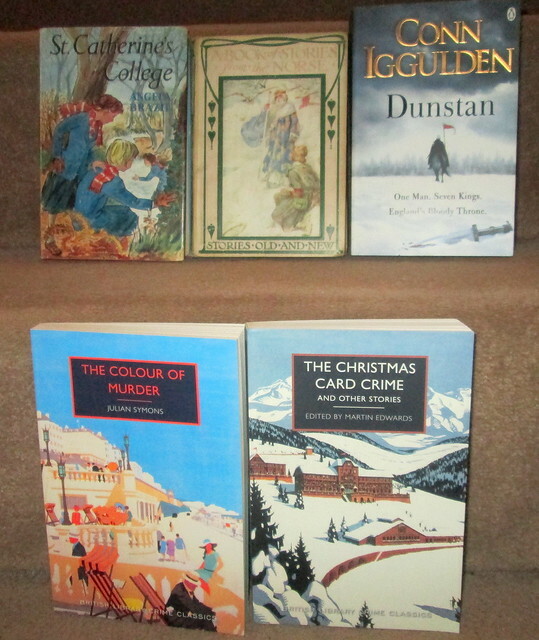 I had been wondering which books I could take with me on my trip as it’s always good to read books that are set in places as you actually visit them, even if it’s now a historical book. Otherwise, I had a lovely Easter Sunday, it was a gorgeous day here in Scotland, we were on the north east coast of Fife, so basically on the edge of the North Sea – not that I dipped any part of me in there, I left that to others. I did see a pod of four dolphins in the distance though. I took photos but I suspect that a magnifying glass will be required to see anything resembling a dolphin. If you are doing the CC spin – are you happy with the book you got? 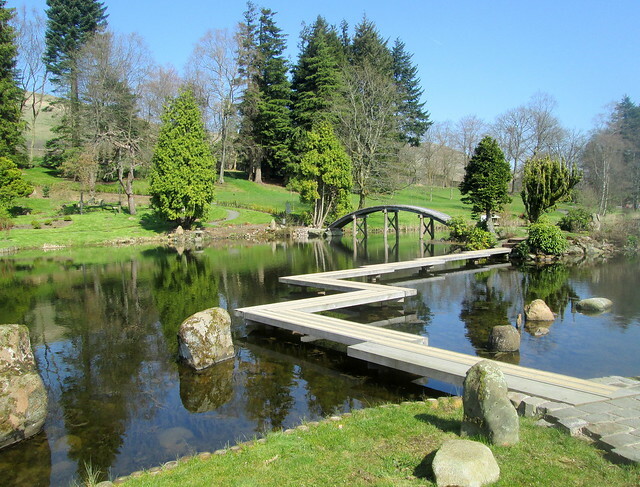 Last Monday was a bright and beautiful day so we decided to drive along The Japanese Garden at Cowden near Yetts o’ Muckhart which is in Scotland’s smallest county of Clackmannanshire. 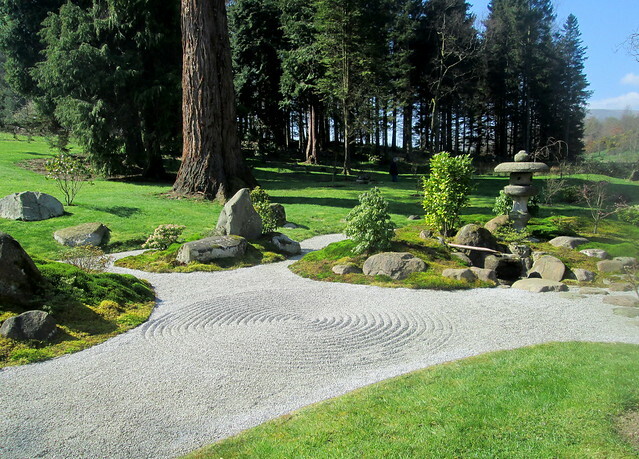 There’s a small area given over to a gravel garden, and we watched a couple of the gardeners carefully raking the gravel and then making circular patterns in it. Luckily I managed to take this photo just before some garndparents took their grandchildren for a scuffle through it, ignoring the ‘keep out’ sign. Reading is wasted on some people! 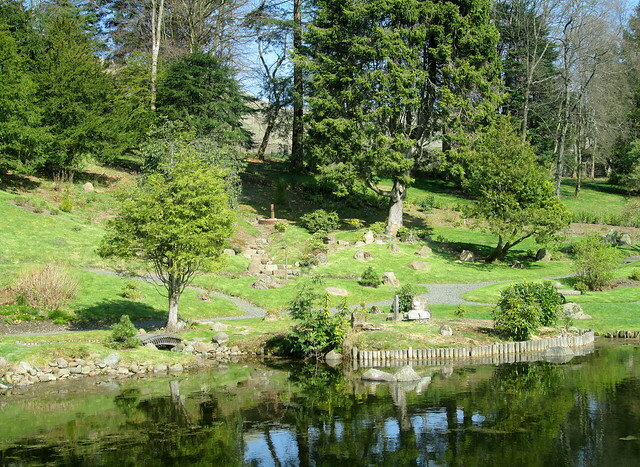 As most of the cheery trees in streets, parks and gardens were already in bloom I thought it would be a good time to re-visit the Japanese gardens that we visited for the first time in the autumn. But it’ll be quite a while before anyone can sit under this tree below’s cherry blossom. 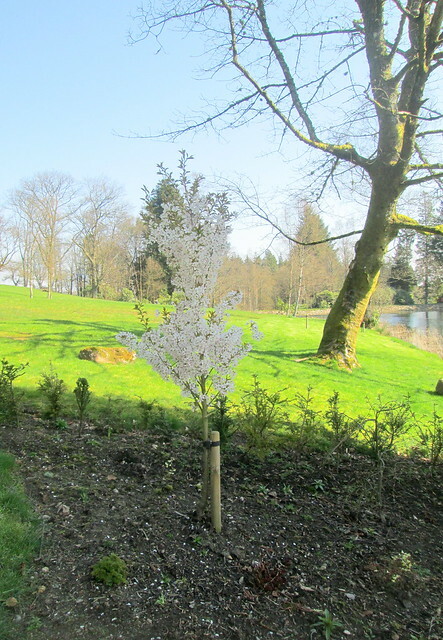 It turned out that as the original cherry trees which were planted in the garden back in the 1920s seem not to have survived, the trees that are there now are really small, having been planted recently. But heigh-ho, we still had a lovely afternoon there. 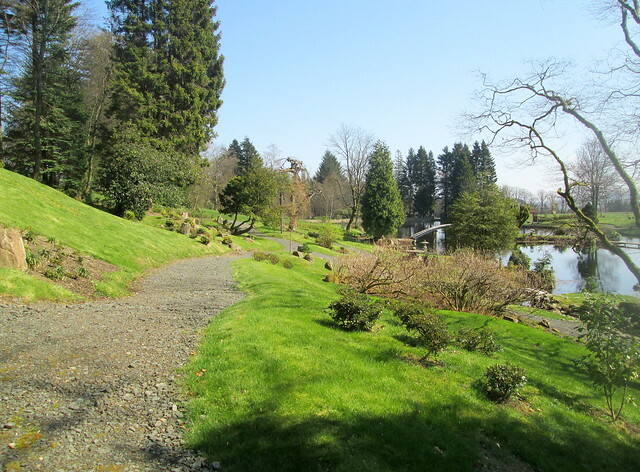 There’s still a lot of work ongoing, such as building new paths and expanding the woodland walk. You can walk across the zig-zag bridge, if you aren’t worried about your balance, but you aren’t allowed onto the arched bridge – Health and Safety probably. The large pond (or is it a lake?) 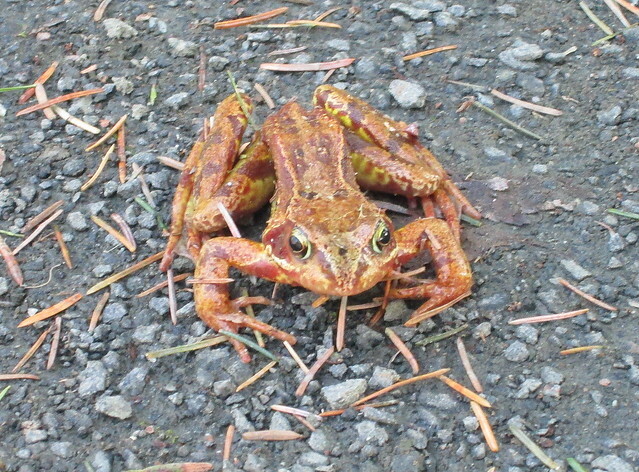 has a healthy amount of frog spawn in it, or maybe it’s toad spawn as when we were in the woodland walk I almost stood on this fine fellow who was sitting on the path, as I approached him I thought he was a clump of autumn leaves – or something even worse that I definitely didn’t want to put my foot in! 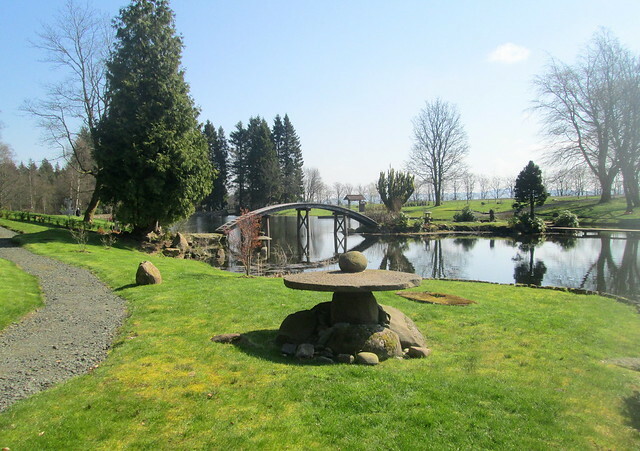 The Japanese Garden at Cowden is certainly worth a visit, although I must admit that we went a bit too early – well I had a ‘two for one ticket’ which was expiring the next day! In another week or so from now the maples will be looking great. In the Name of the Family by Sarah Dunant was published in 2017 by Virago and it’s a sequel to Blood and Beauty which I blogged about here so it’s a continuation of the Borgia family’s story. It’s a chunky read at 488 pages. It begins in 1501 and Niccolo Machiavelli is a young poverty stricken diplomat and witness to many of the shenanigans going on within the Vatican where an elderly and ailing Rodrigo Borgia is still Pope Alexander VI. His daughter Lucrezia is now on her third husband, and is Duchess of Ferrara, her life isn’t her own, she’s used as a political pawn by her father and as ever for women of those times she’s under pressure to give birth to a male child. Pope Alexander’s remaining son Cesare realises that when his father dies the power that the Borgias have had is going to disappear. Cesare has never been one to toe the line. The whole book is liberally scattered (or should I say pock marked) by references to the French pox as it had become almost an epidemic, it’s a historical fact that syphilis first appeared around this time, apparently brought to Italy by French troops. I didn’t enjoy this one nearly as much as Blood and Beauty. I have a feeling that Dunant wasn’t as interested in this part of the Borgia story and even the arrival of Machiavelli didn’t help with what seemed to me to be quite a flat book. As you would expect not everyone agrees with me. * List any twenty books you have left to read from your Classics Club list. * Number them from 1 to 20. * On Monday 22nd April the Classics Club will announce a number. * This is the book you need to read by 31st May. My list is a bit different this time. Are any of these ones favourites with you? 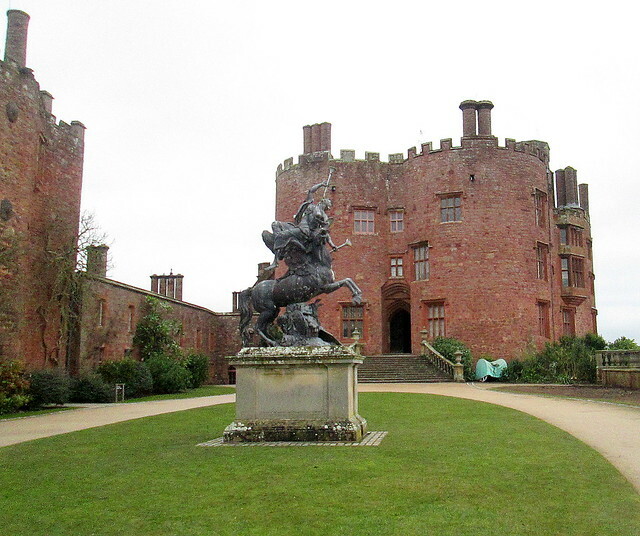 It is ages since we visited Powis Castle, when we drove all the way down to Wales so that Jack could go to a football match, in fact it was over a year ago. 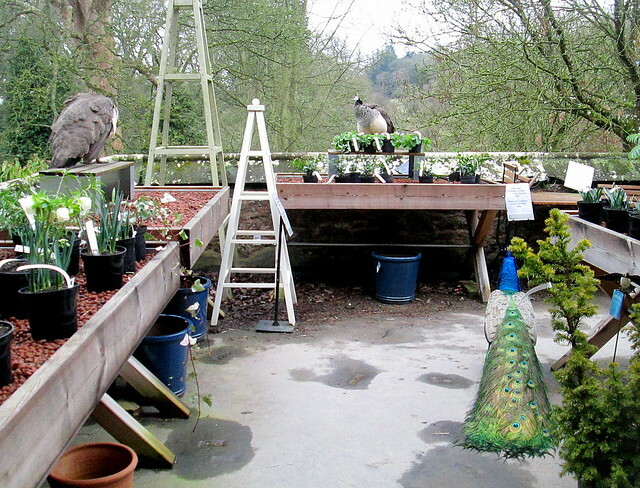 I could have sworn that I had blogged about our visit, but apparently not. This often happens to me as I ‘write’ blogposts in my head, but get no further than that, and then I think it’s done and dusted! Powis is the only castle in Wales that I’ve visited, according to a recent TV programme I watched most of the castles in Wales are actually English as they were built by the English to keep the Welsh in order. Thankfully the same does not apply in Scotland, our castles are very definitely Scottish, and so different from those in England. Some Welsh people apparently have a bit of a problem about having all those English built castles looming over them, and I can’t say I blame them, but on the other hand – they are still interesting and historic structures. 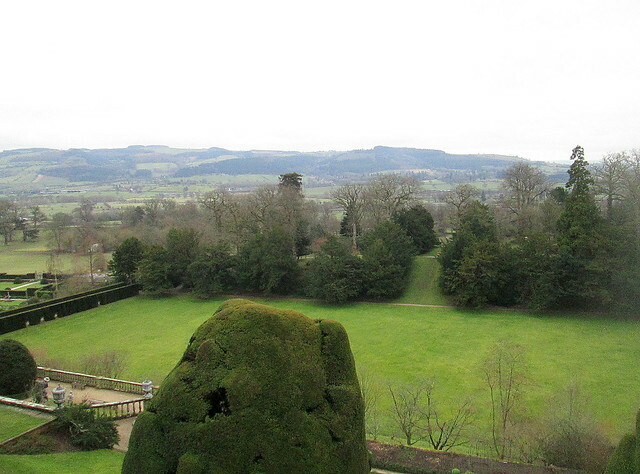 However, Powis is unusual in that it was actually built by a Welshman in the 13th century – Gruffydd ap Gwenwynwyn. Apparently he was given permision to build it by Edward I as he had been so loyal to him. As Edward I was also known as The Hammer of the Scots I can only imagine that Gruffydd ap Gwenwynwyn’s loyalty was rooted in fear. 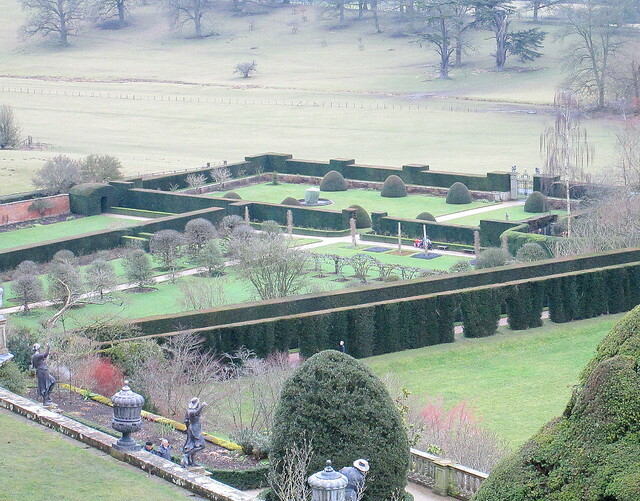 As I recall it was very cold, well it was February, but the gardens still looked lovely. You can see the bones of the planting better in winter, but I would like to go back in the summer sometime, there are so many other castles in Scotland to see though, so I may never get around to it, Wales isn’t exactly handy for us. 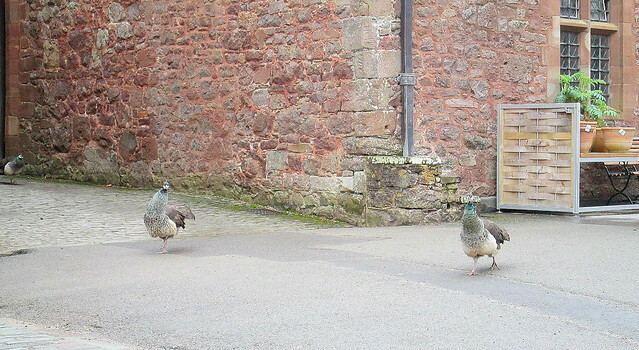 The peahens were patrolling around the grounds. And when I walked around the plant sales area below they were all over the place, holding me up, but I did manage to buy a souvenir of my visit in the shape of a Sarcococca confusa (Sweet Box) but it hasn’t flowered this year. I live in hope! 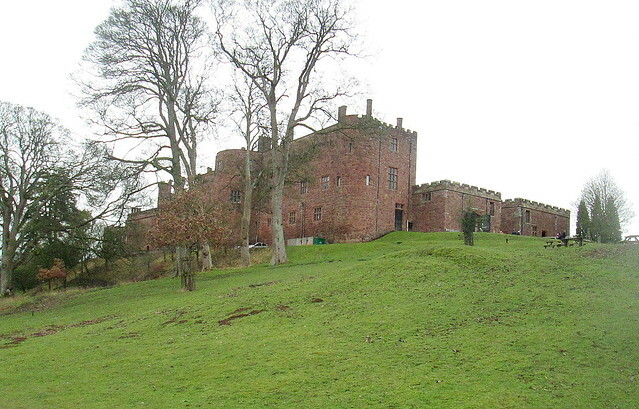 You can see some fantastic images of Powis Castle here.